[120 ° Wide Angle lens 720phd camera] with 720p HD camera, you can take high-quality photos and videos. Not only that, but you can shoot more wide and beautiful photos and videos with a 120 ° wide angle lens. You can use the packed VR goggles to experience 3d visual effects and great sensations. Take a drone and shoot a warm video during the weekend climbing or picnic! [Headless Mode & Altitude maintenance] equipped with a pressure sensor, it is excellent stability. The scenery of each angle is neatly seen. Do not miss the moment you want to take. And, headless mode moves in the direction seen from the pilot no matter where the aircraft is pointing. I think this feature is very important as a beginner. There is no need to worry about the situation without controlling the drone. [VR Goggles & LCD monitor] A perfect combination of drone and VR goggles and LCD monitors. There are two ways to play. The first way to play is without a smartphone, you are piloting the drone while observing the monitor. 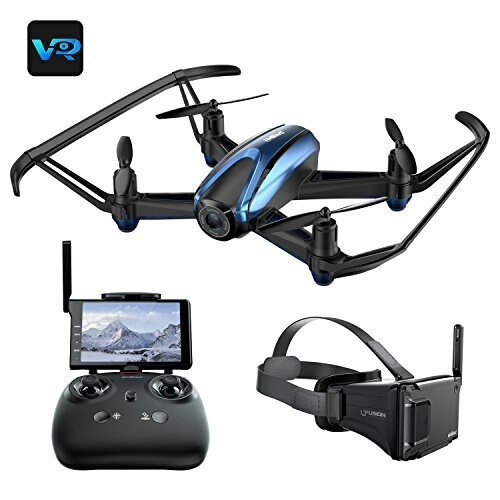 The second way to play is to let the adults fly the drone, the child will put the monitor on the VR goggles, and put on VR goggles, and the natural charm will be sensing in 3d form by the control of the parents. Enjoy drone fun with your family! [present recommendation & Security Guarantee] smartphone unnecessary! No tablet! It is recommended to give a present to a senior/friend/child. Please note: This product has a three-month warranty deadline, so please feel free to contact us if you have any problems during use. Other than the guarantee period, it is all right. [Signal Alarm] If the battery is low enough, the transmitter will start ringing.